Katherine Hayles said our readings, “…even a biologically unaltered homo sapien can count as posthuman. The defining characteristics involve the construction of subjectivity, not the presence of nonbiological components.” Our group aims to explore that quote in terms of the reality of the meaning of what it means to be post human in today’s society. As opposed to being a literal human/machine hybrid, we’re focusing on the more abstract way that humans today can be cybernetic. Society is so entangled with digital space, our mobile devices and connection to the internet so we feel that technological elements that we rely on are extensions of ourselves. We want to use ‘nomophobia’ as a structuring element for out video essay. Nomophobia is the fear of being out of contact with a mobile phone. When many of us forget or leave our phone somewhere, we feel a sense of disconnect or stress that we’re missing something important. This translates into cyborgs in the way that people have evolved to rely on devices and inherently, those devices are viewed as an extension of self. People express themselves through their devices, connect with others through devices and document their lives through devices. We plan to do this in a mashup fan video and video essay manner. We want to draw clips from television and movies where we see this reliance and heavy use of mobile and technology being used and explain them in a manner that relates to our view. We have also found a song that we want to use to help illustrate how frequently people turn to their devices and social media. This video we found mimics the nature of the facts we have found and want to share about nomophobia and the dependence of today’s society on technology. This video is effective in displaying how social networking sites have become more popular and integral to society and our aim is to show how we today have evolved to need mobile devices and how integral it has become–but also as a medium that connects us to social media. The American version of The Office, an NBC comedy, drew a large following over the course of seven years. In terms of transmedia storytelling, The Office is a perfect example of expansion of a story through the use of webisodes. Transmedia, as described by Henry Jenkins in his article is “a process where integral elements of a fiction get dispersed systematically across multiple delivery channels.” (Jenkins) In terms of The Office, characters of the show were able to show audiences a more in-depth insight into their personalities within the webisodes. The Office had a number of webisode series: The Accountants, Kevin’s Loan, The Outburst, Blackmail, Subtle Sexuality, The Mentor, The 3rd Floor, The Podcast and The Girl Next Door. “Transmedia storytelling practices expand the potential market for a property.” (Jenkins) The market for The Office was expanded from television to the web, giving devoted fans a chance to learn more about their favorite characters or see lesser known characters in another light. Urging the audience to move from television to webisodes was done by means of something described as a migratory cue—something that directs an audience from one form of media to another. During the 6th season of The Office, the characters of Kelly Kapoor and Erin Hannon started a girl group called ‘Subtle Sexuality.’ Their first music video ‘Male Prima Donna’ was briefly mentioned in an episode and then an advertisement ran, suggesting audiences go online to catch the music video. Henry Jenkins touches on world-building, which The Office has done incredibly. The term world-building refers to “complex fictional worlds which can sustain multiple interrelated characters and their stories.” (Jenkins) While Dunder Mifflin exists in a world that is extremely familiar to American audiences—a neutrally colored office setting in a decent sized town where blue collar warehouse workers and white collar office employees work together; nothing too outrageous for audiences to relate to or comprehend. Take a regular town with nothing ridiculously exciting, focus on characters that emulate ‘that guy’ at your job and you have an insanely relatable sitcom. Fans have come to know the layout of the office, the popular after-work bars where the ‘Dundies’ are held and other local businesses in the area. The Office doesn’t create an unrelateable fantasy world, but rather a relatable one. 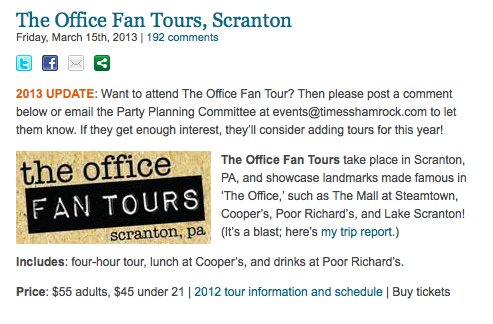 One where fans can now take Office tours of Scranton, PA.
Migratory cues can lead audiences to another platform of the same story, in this case, multiple webisode stories. These webisodes demonstrate the “ability to keep in mind multiple alternate versions of the same fictional world.” (Murray 40) Audiences are exposed to more than just the main storyline of the television show, with the ability to explore further into subplots. 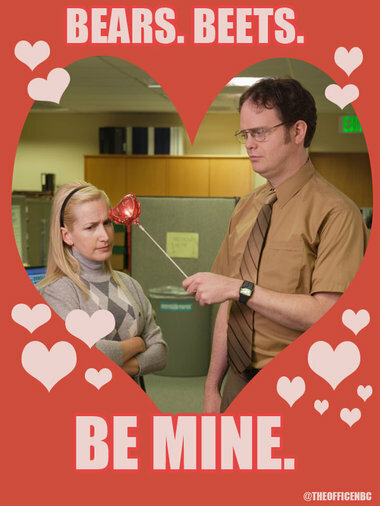 The webisodes are supplemental, adding to the fictional world of Dunder Mifflin and its employees; but never detracting from the main television series, meaning that audiences won’t miss anything if they don’t watch the webisodes. Jenkins, Henry. “Transmedia Storytelling 101.” Confessions of an AcaFan. N.p., n.d. Web. 01 Mar. 2014. Murray, Janet Horowitz. “Harbingers of the Holodeck.” Hamlet on the Holodeck: The Future of Narrative in Cyberspace. New York: Free, 1997. 27-64. Print. The Nintendo Wii was released amid fanfare and the premise of revolutionizing gaming in 2006. 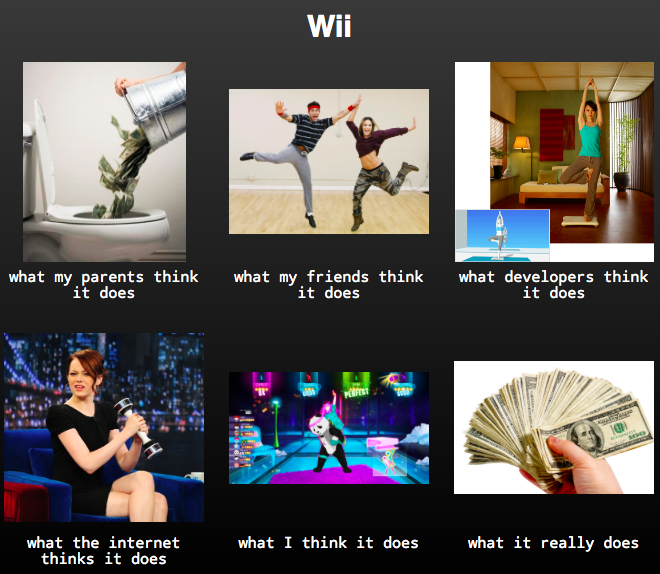 The handheld, user-controlled interface of the Wii created a drastically different, more interactive gaming experience. Instead of a sedentary experience the Wii prompted users to become physically engaged, paving way to a sense of ‘astonishment’ as Gunning describes it. Fascination with the unfamiliar became coined as amazement and “…amazement as an adaptive behavior to new stimulus.” (Gunning) While the essay deals with what we currently consider ‘old technology’ as being new, newness becomes a relative term. Undoubtedly though, “Over the past two decades video-games have become an integral part of the new multimedia culture.” (Giannotti) As video games have grown, so has the amount of personal engagement necessary to be fully involved. The Nintendo Wii created a new experience—striking visually and physically. The on screen display was bright and modular, neat and coordinated in a grid style. Playing any game on the Wii required standing up and physically becoming involved. This was a new (and striking, as Onian would describe) experience for many. Quite literally, the next step in experiencing the newness of the Wii was a physical paralysis. That paralysis ranged from confusion of how to handle or maneuver the sensitive Wii-mote to vocal loss of words (of awe or frustration). The experience of such an interactive interface was new and pivotal the entire family, from the children to the grandparents. After a bit of practice and repetitive actions, “Even the astonishing becomes familiar.” (Gunning) As with anything, the old adage of ‘practice makes perfect’ clearly applies, as with repeated use of the system, the user becomes familiar and more comfortable. In terms of Onian’s essay, the user has formed a mental reaction which results to their learning. Surprisingly, the mental reaction and learning spurred an opportunity for medical professionals to utilize the game system for more than its original intention. “The influence of a systematic laparoscopic simulator performance,” was studied, showing that the Nintendo Wii assisted doctors in learning computer-controlled nature of laparoscopic techniques (Giannotti). Giannotti, Domenico, et al. “Play To Become A Surgeon: Impact Of Nintendo WII Training On Laparoscopic Skills.” Plos ONE 8.2 (2013): 1-7. Academic Search Premier. Web. 2 Feb. 2014. Gunning, Tom. (2003) “Re-Newing Old Technologies: Astonishment, SecondNature, and the Uncanny in Technology from the Previous Turn-of the Century”. In D. Thorburn and H. Jenkins (eds), Rethinking Media Change:The Aesthetics of Transition. Cambridge, MA: MIT Press, pp 39-60. Hsu, Jason K., et al. “A ”Wii” Bit Of Fun: The Effects Of Adding Nintendo Wii®® Bowling To A Standard Exercise Regimen For Residents Of Long-Term Care With Upper Extremity Dysfunction.” Physiotherapy Theory & Practice 27.3 (2011): 185-193. Academic Search Premier. Web. 28 Jan. 2014.